Aging eyes bring more than crow’s feet and wrinkles. It’s what you can’t see—the health of your eyes—that is the bigger concern, doctors say. By the age of 40, many people may begin coping with vision problems they didn’t have before. These might include dry eyes and presbyopia, or an inability to focus on objects that are close up, and can leave people feeling fatigued and headachy by the end of the workday. 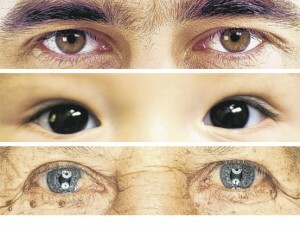 Genetics largely determines how our eyes age. But new research suggests that nutrition and environment can lessen some of the risks to eye health and vision. While we can’t win against Mother Nature, some strategies can minimize the damage. Avoid self-prescribing with, say, off-the-shelf reading glasses sold at drugstores, says Gary Etting, an optometrist who specializes in vision therapy in Los Angeles. People often select glasses that appear to make things clearest, he said. But this may be a stronger prescription than they need, which can encourage their loss of focus to go faster. Scientists have been studying ways to prevent vision problems in young people, which also might help protect eyes as they age. Two studies published in the May issue of Ophthalmology, the journal of the American Academy of Ophthalmology, suggest that spending time outdoors may help minimize or prevent nearsightedness, or myopia, in children. Myopia can be corrected with glasses or contact lenses. But it can also be a precursor to severe myopia in adulthood, which is linked to the later development of eye disorders such as glaucoma and retinal detachment. One of the studies, involving 571 students in Taiwan, compared changes in eyesight over a year between a group of children that had outside recess and another that didn’t require going outdoors. The other study, in Denmark, compared detailed eye measurements of 235 nearsighted children taken during periods of longer and shorter days. Some researchers believe the effect could be related to oxygen exposure or the amount of light exposure causing the pupil to constrict. It could also result from children focusing at far distances for extended periods. “I think the conclusion we’re most comfortable drawing is that the jury is still out on that,” said Rachel Bishop, chief of consult services of the National Eye Institute, who wasn’t affiliated with the studies. Other possible reasons, such as greater physical activity when outside or less time spent looking at screens indoors, seem less likely, she said.